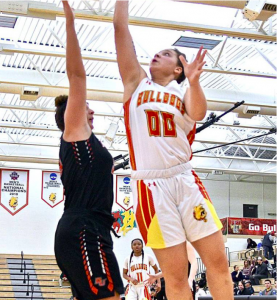 Posted by Mollie Hamelund on January 18, 2019 in Basketball, Sports. The Ferris women’s basketball team is rebounding off of last season’s success and starting this new season strong. They already have a winning record halfway through the season, which is giving the team the motivational boost they need. Huggins, one of the starting five of the team, has already received Great Lakes Intercollegiate Atheltic Conference (GLIAC) Player of the Week honors this season. After just arriving last year, she is already making her mark. Last season, the Bulldogs made it to the GLIAC Tournament Seminals and lost to Grand Valley State University. With a young team this season, the team is preparing for more battles, as there are still plenty of conference games to be played. Ferris sophomore guard Adrienne Anderson has also brought home GLIAC player of the week honors for Ferris and is also one of the starting five this year. Anderson said she has taken on more of a leadership role since she has become a starter. The team is coming off a couple tough losses against Michigan Tech University and Northern Michigan University that brought their conference record to 4-4. The Bulldogs plan to finish the last half of the regular season strong with a winning mindset. Faustin is in her fourth year as the head coach of the Bulldogs, with last year being her most successful year, and she plans to continue the success by only going further this year. The Bulldogs look to turn the trend around 5:30 p.m. Thursday, Jan. 17, against Purdue Northwest and stay undefeated at home.